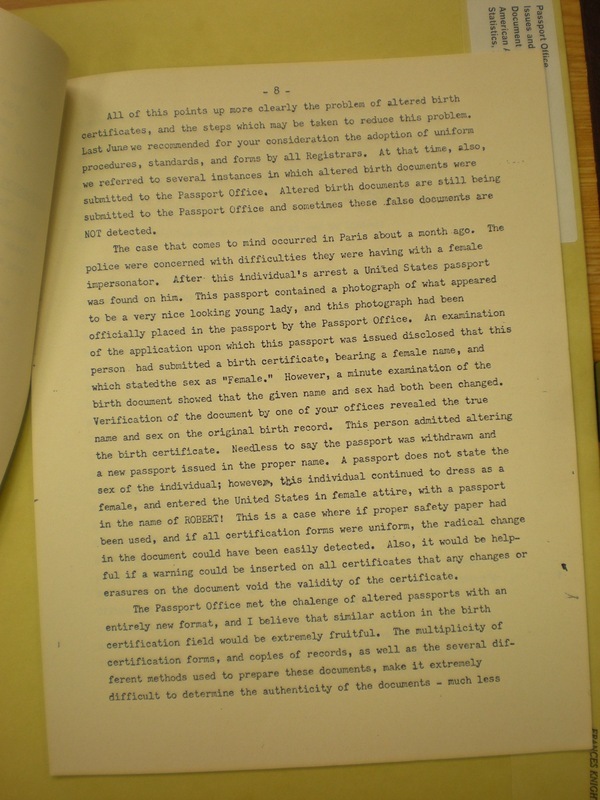 American Association for Vital Records and Public Health Statistics, “Panel Discussion: the Reduction of Fraud in the Use of Vital Records, Held in the Abbey Hotel, New York City, New York, Friday, June 2, 1961,” Folder “Passport Office/Issues and Controversies/Document Fraud/American Association for Vital Records and Public Health Statistics,” Box 52, Frances Knight Parrish Papers, Herbert Hoover Presidential Library. The documents reproduced here are among the records of Frances Knight Parrish in the custody of the Herbert Hoover Presidential Library and the National Archives of the United States. Shane Landrum does not claim any copyright interest in these official U.S. Government records. Digital images by Shane Landrum, June 2008. American Association for Vital Records and Public Health Statistics, "Panel Discussion: the Reduction of Fraud in the Use of Vital Records, Held in the Abbey Hotel, New York City, New York, Friday, June 2, 1961," in cliotropic research, Item #161, http://cliotropic.org/sources/items/show/161 (accessed April 21, 2019).